Love my Big Wool Coloured! 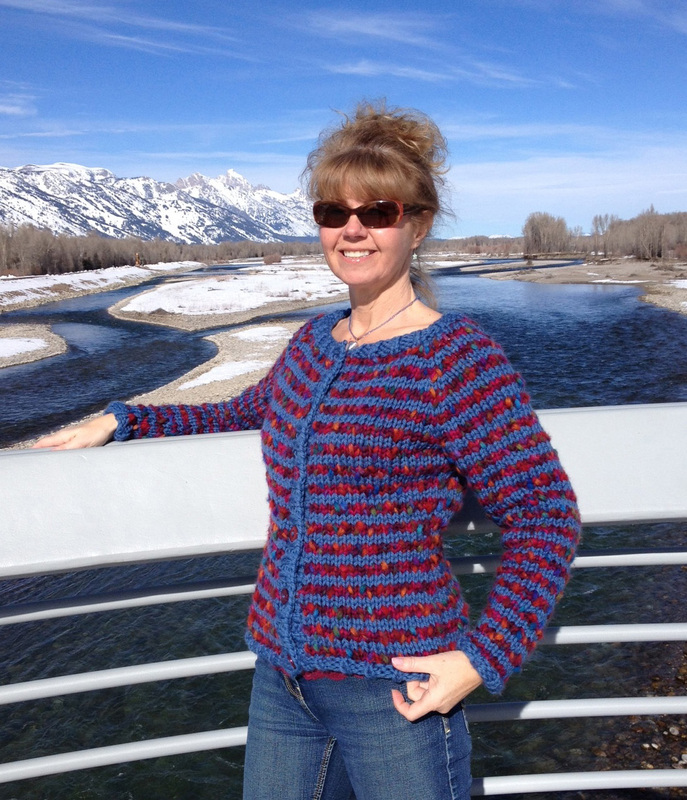 Ever since I saw the cardigan Jitterbug designed by Lisa Richardson from the Big Wool Colour Collection I have been dying to make it and now here it is …….. finished! 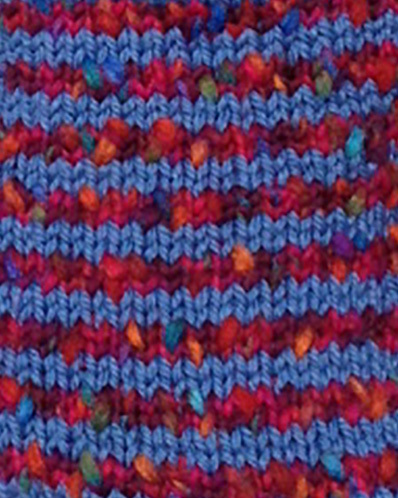 Jitterbug is knitted using alternating stripes of two rows of Big Wool and two rows of Big Wool Colour. 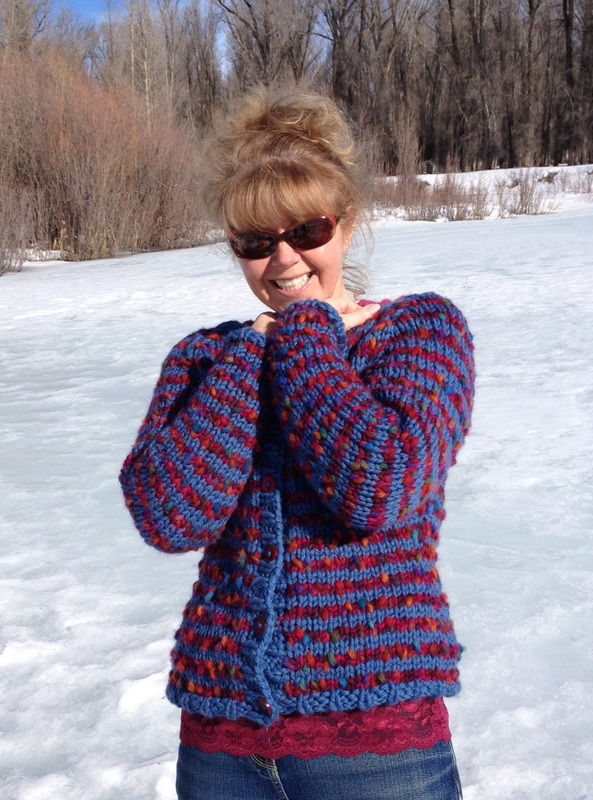 It was super quick to knit as it is knitted on big needles: 9mm (US 13) and 10mm (US 15). I managed to finish it in two weeks! The original design, pictured below, was knitted using the shades Vert (Big Wool) and Carnival (Big Wool Colour) which I did like very much but I wanted something less greeny and more blue. Sometimes it can be perplexing choosing different colour combinations. You might just have small snippets on a shade card which you cannot place side by side to see how they interact with one another. It is slightly easier if you have a local yarn shop which stocks all the shades; you can then hold two balls next to each other and even place them up to your face and look in a mirror to see how the overall colour looks against your skin. I only had a shade card so this is what I did. I chose the Big Wool shade first as I saw this as the background colour. I narrowed it down to Blue Velvet and Steel Blue. I then looked for a Big Wool Colour shade that would stand out but also harmonize rather than clash with these two blues. Carnival and Jamboree were out straight away: too much green and too much grey, respectively. Fete and Waltzer were out too as they were very purple but may well have worked quite well. Carousel had lots of blue through it and would harmonize well with the two blues but then would the striping stand out or get lost? That’s why I went for Fairground. It was overall a blue-red shade so would harmonize well with the blues. As it is on the dark side I chose the lighter Steel Blue shade to allow a contrast in tone to help the stripes stand out. Well, I am really happy with the result and love my Jitterbug! 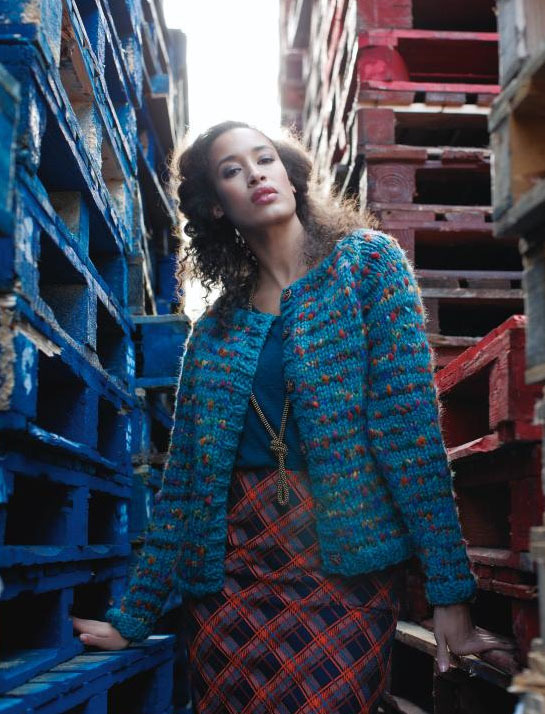 Jitterbug is more than just a cardigan; it is like a cross between a cardigan and a knitted jacket. It is easy to wear with just a camisole underneath like I have done in the photos but I also wore it with a thicker top and it felt lovely and cosy! I love the neck line too; it is more open rather than close up around my neck which doesn’t really suit me. I also chose to add 6 different buttons in a pink-plummy shade, which you might be able to see in the picture below, just to make it even more unique! 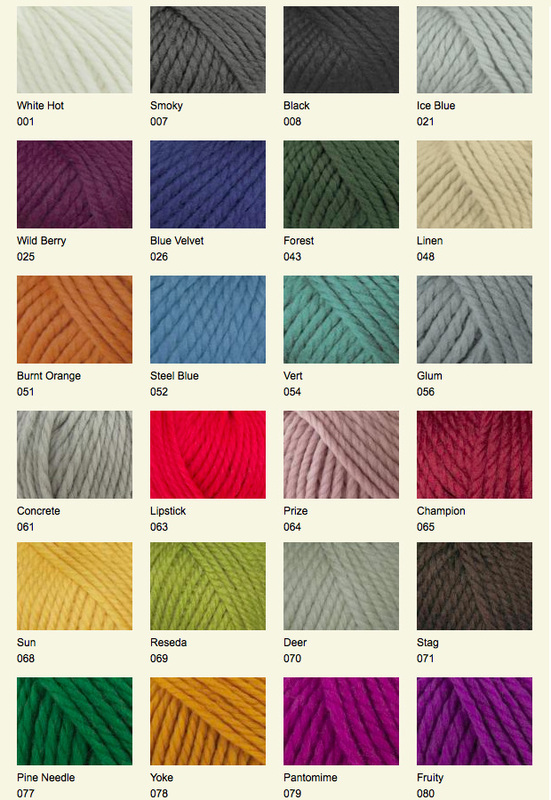 If you would like to knit something using Big Wool Colour take a look and some of my favourites from the Big Wool Colour Collection. 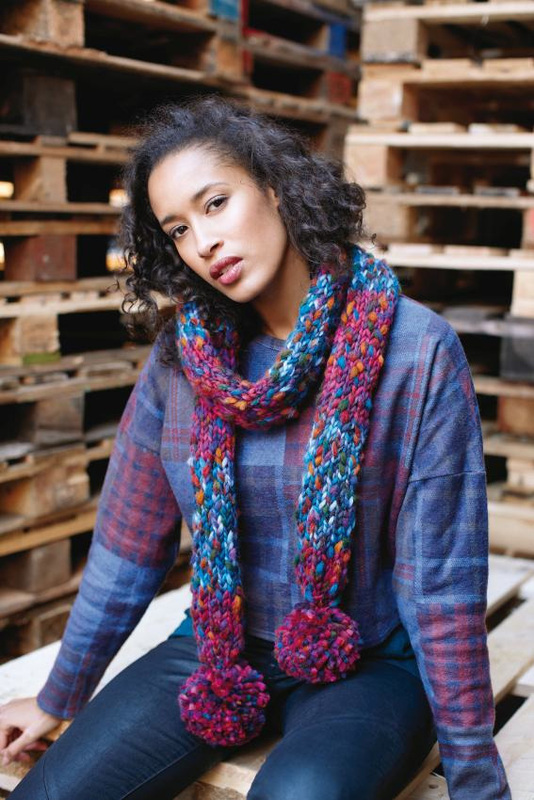 This scarf called Fandango will be very quick to knit up……..
Love this sweater called Cancan ……..
You can also go to an earlier post of mine which includes more pictures of Big Wool Colour designs …… please click here to read that post. Designed by Sarah Hatton and using Big Wool this slipper pattern can be customised to your hearts content. You could add creative embroidery or crochet trims or pom poms, buttons or bells, whatever you feel like!! I will definitely add some Big Wool Colour! 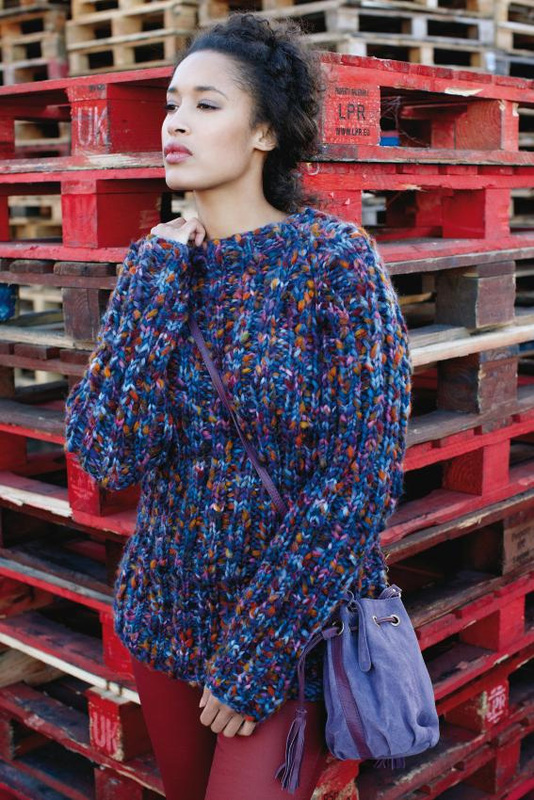 Have you knitted something using Big Wool Colour? I would love to know what you made and if you had a colour choice quandary and how you solved it. Please share your colour dilemma with me and my other readers by leaving a comment at the bottom of this post….thank you! 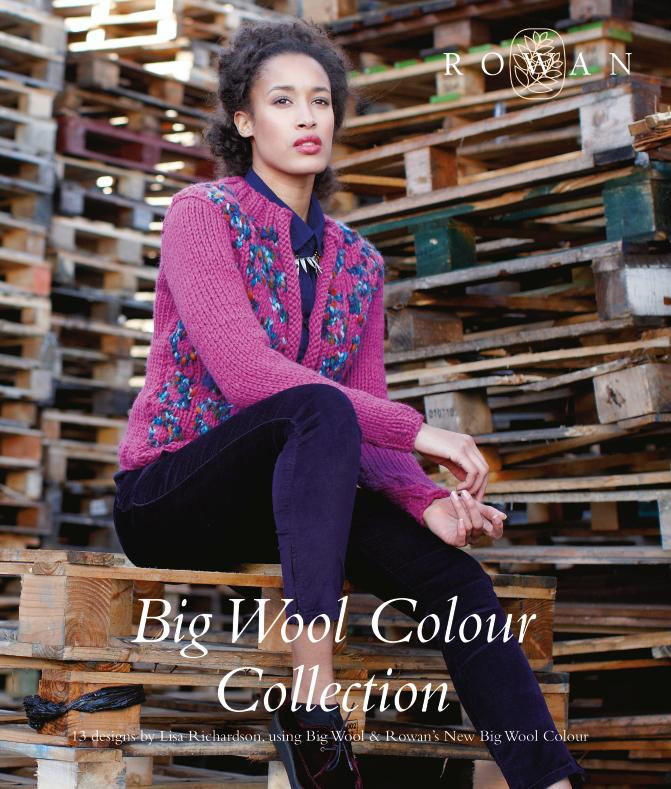 If you would like to see all the designs from the Big Wool Colour Collection by Lisa Richardson please on the brochure’s cover image below. If you would like a copy of the free slipper pattern click on the link below and it will take you to the Rowan website. If you are a member login to the Row@n Members page or register to become a Row@n Member…..it’s free to join! 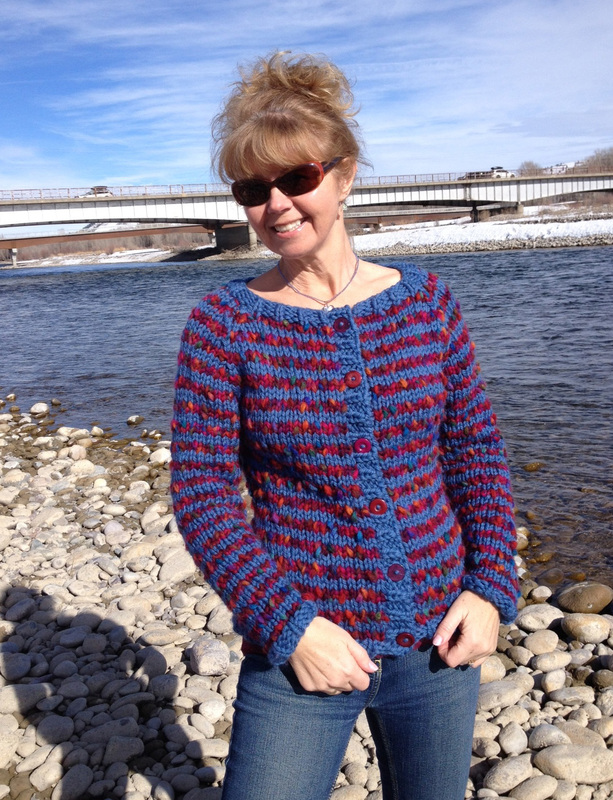 You can only download free patterns if you are a Row@n Member and are logged in. I try to post images of my latest knitting projects on my What Colours Make facebook page. Click What Colours Make to take you there. If you do take a look….while you are there please “Like” my page if you like it! Thanks! Thanks so much for reading my blog. If you would like to receive email notifications for my new blog posts please click here to subscribe.